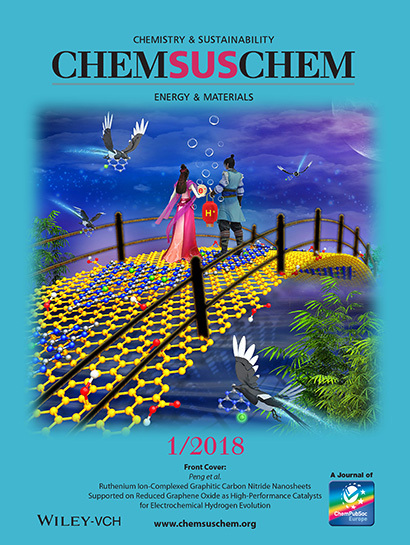 The cover image for the January 10 issue of ChemSusChem was designed by UCSC graduate student Yi Peng, first author of a paper on a novel catalyst for hydrogen production. The image, which shows the production of hydrogen gas when electrons and protons meet on the catalyst, is based on the ancient Chinese legend of Niulang and Zhinü. Niulang was a human cowherd and Zhinü was a fairy from heaven. They fell in love, but their love was banned by the fairy's queen, who created the Silver River to separate them. The lovers were only able to see each other once a year, on the 7th day of the 7th lunar month, with the help of a flock of magpies that formed a bridge.